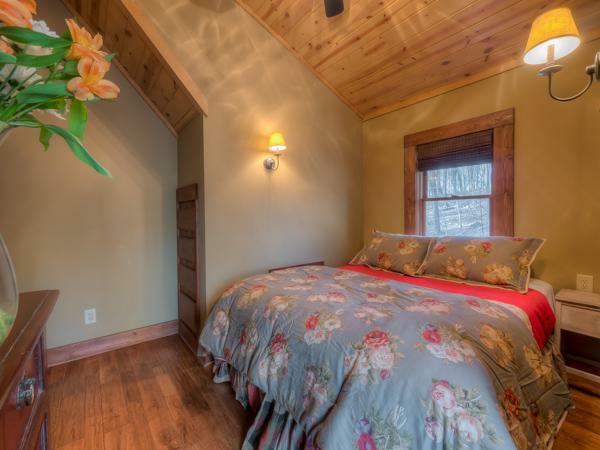 Recently featured in Log Home Living Magazine...at Chestnut Lodge, you will breathe a sigh of nostalgia, gently releasing the present-day stress. 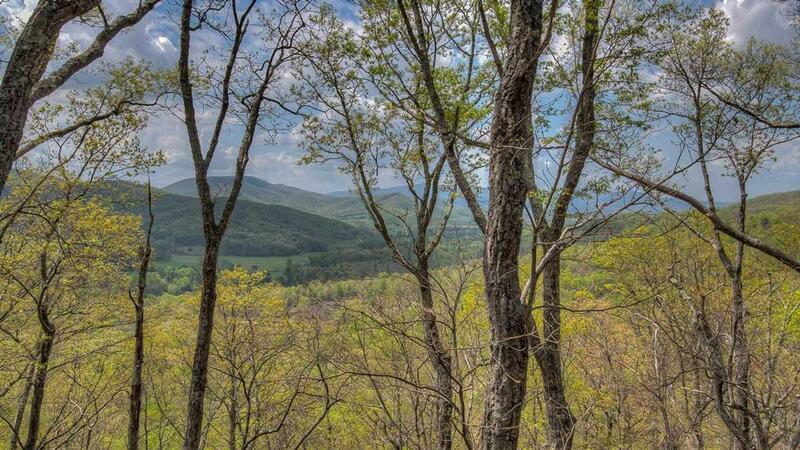 The home sits serenely over miles of pastoral fields nestled in between the rolling mountains. 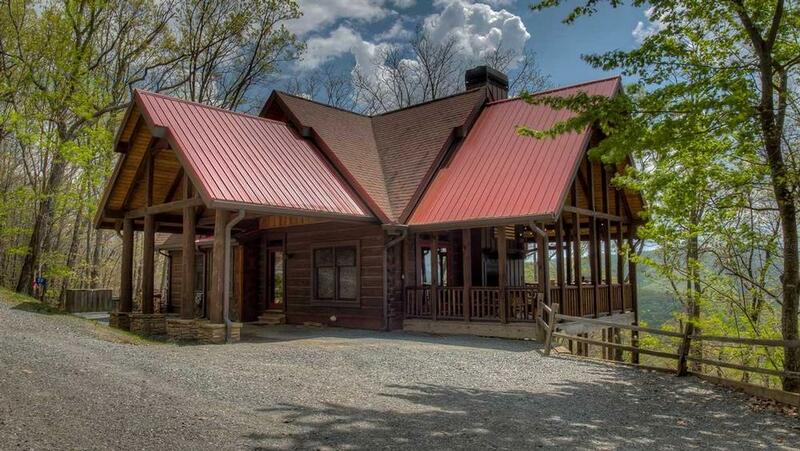 Chestnut Lodge is a beautifully-crafted custom Barna log home, with 3000 roomy square feet offering plenty of comfortable crevices. 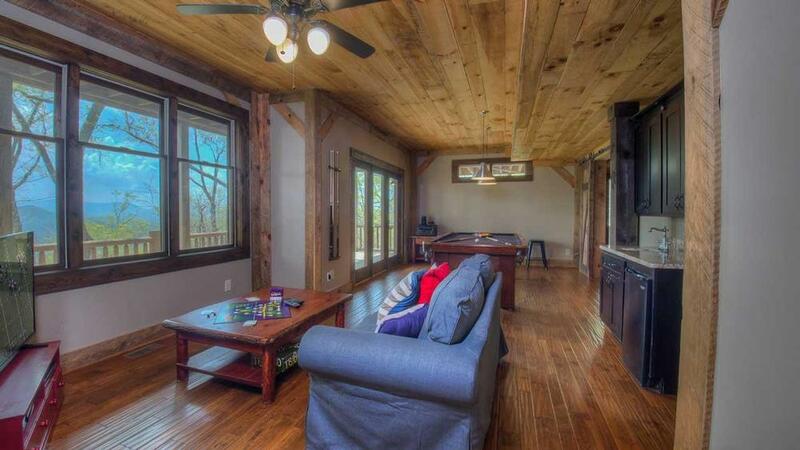 The open floor plan is perfect for gatherings but Chestnut Lodge has lovingly appointed corners with furnishings that invite you to your own personal time. The light-filled home has picture-perfect windows framing idyllic scenes of soft valleys, hills and long-range mountains. Sitting in front of the beautiful stone fireplace you will appreciate the home's design inspiration: the decor marries upscale farmhouse and mountain styling with the newest, top of the line finishes — modern fixtures with a hint of vintage. The welcoming kitchen has granite counter tops, an apron farmhouse sink, oil-rubbed bronze fixtures and fine custom cabinets in a time-washed hunter-green stain. Plenty of room for food preparation gives way to an amazing deck outlined with strings of muted lights and an expansive dining table that is perfect for flavorful meals and storytelling. A gorgeous outdoor hearth is also the perfect spot in winter to roast some chestnuts in the fire or marshmallows in the summer as you count the gliding fireflies. 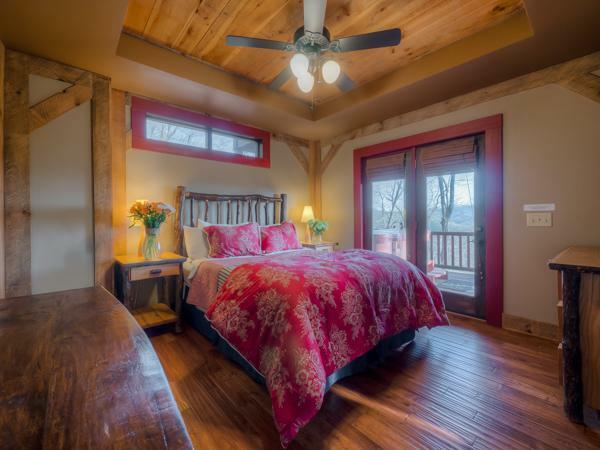 Great naps await whether on the hammock off of a bedroom porch, or in the five cozy bedrooms with classic mountain-home furnishings, high-thread linens and plush comforters. 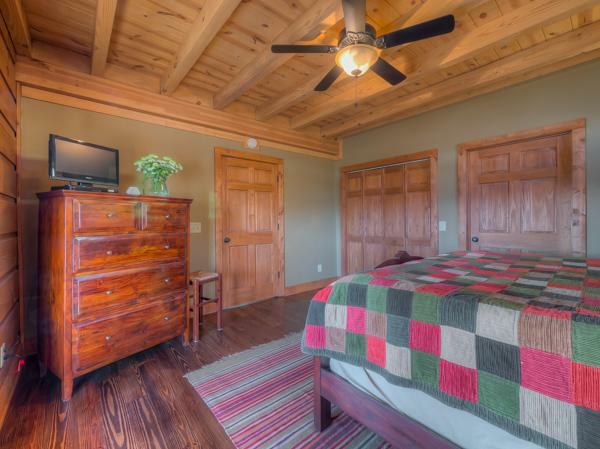 The five-bedrooms all have their own peaceful views and in total, 14 people can sleep in the home comfortably. 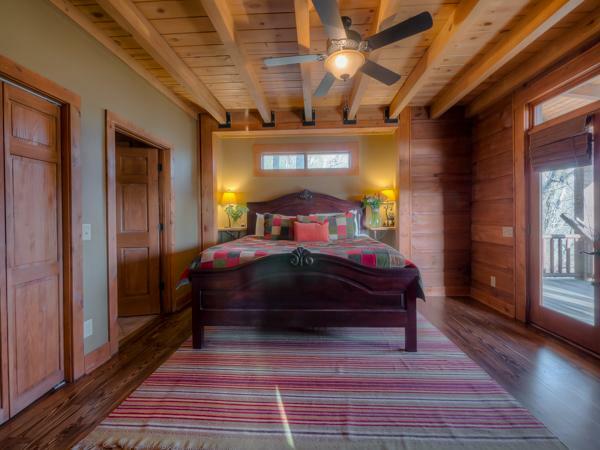 The master bedroom has a king-sized bed, and three other bedrooms have queen size beds. 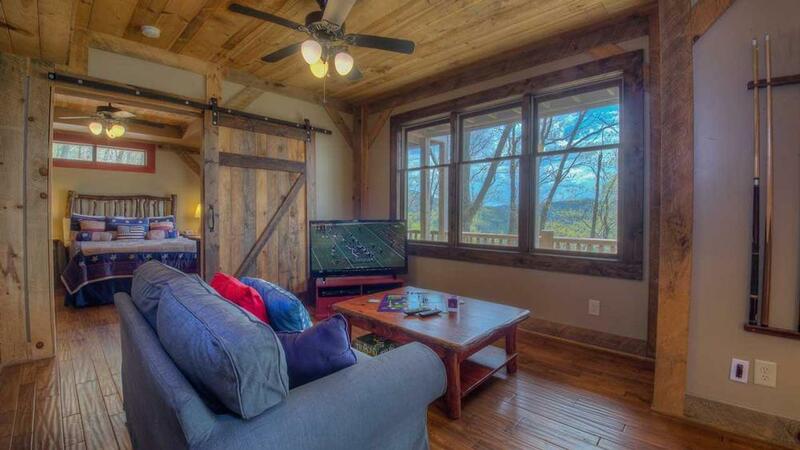 Farmhouse barn doors pull open on sliders to also reveal a final bedroom with bunks for six, a sure throwback to the best slumber party you can remember. Everyone can also retreat to the home's lower level which offers more living space, a wet bar, regulation billiards table and home theater. 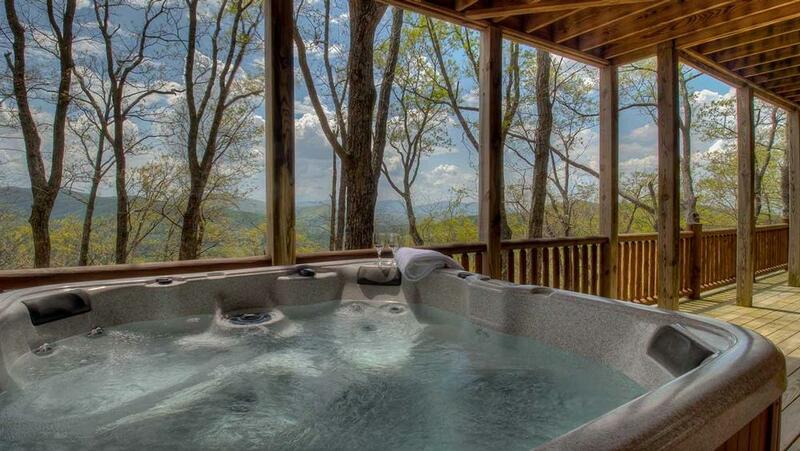 The lower level deck provides a great hot tub and viewing spot to take in nature's surround sound from nearby birds chirping or the distant cows settling in for the night. Chestnut Lodge is a place of true relaxation and one that fulfills the longing of old comforts with a renewed feeling of today. 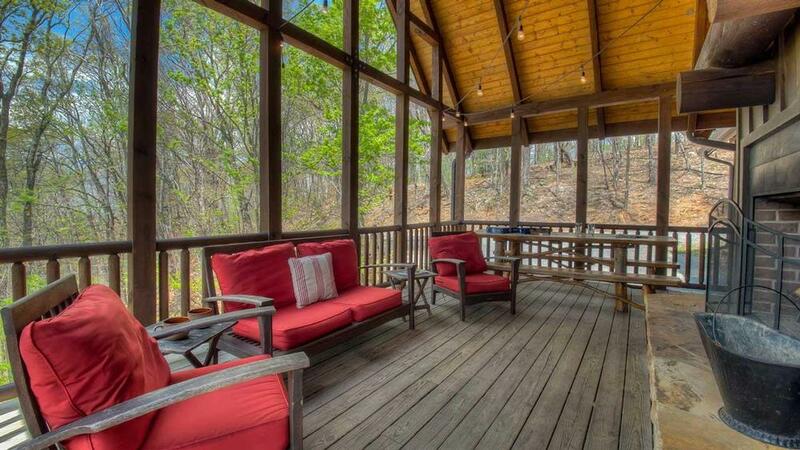 This splendid home is conveniently located in the Morganton area of Blue Ridge, and is close to Lake Blue Ridge as well as all that the region has to offer. 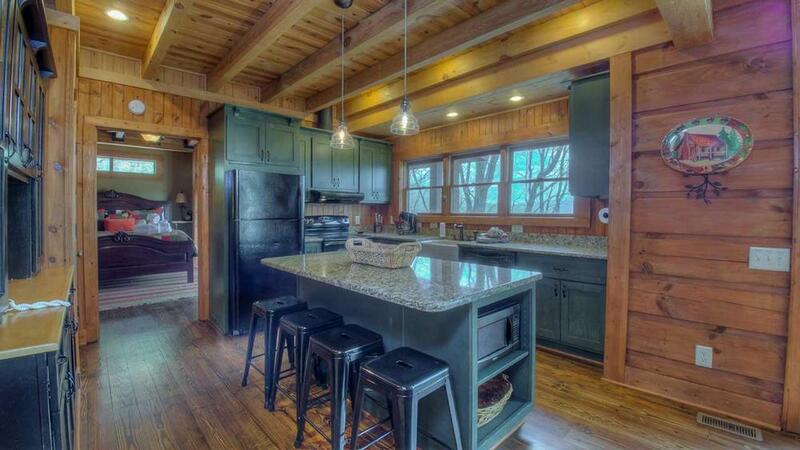 03/19 - We enjoyed the space this home offered. We were traveling with 11 people, and the space perfectly fit our needs. Our favorite spot was the outdoor fireplace! I’m impressed with your company. We had a problem with the indoor fireplace not staying lit. The house manager on duty came out at night and fixed it for us. Your company is top notch. 01/19 - Loved the rooms and the view. Great service. 12/18 - Our favorite features of the home were the size of the cabin, the view, and the supplies available in the cabin. 07/18 - The cabin itself with so many beds and the secluded location in the mountains worked great for our mom's 83rd birthday! We had a great time! 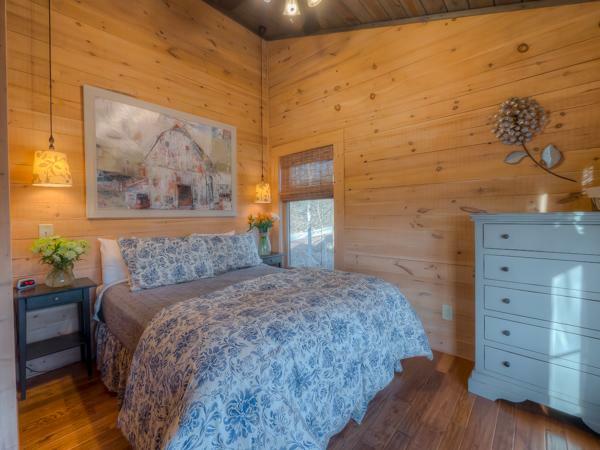 Escape to Blue Ridge is my go-to cabin rental company for probably five times running now. Had experiences with others -- not so great -- but no issues at all with Escape to Blue Ridge. 07/18 - The size and location are great. Lots of things to do in this area and with a large home it’s fun to gather as multiple families and enjoy together. 06/18 - Enjoyed the hot tub and checkers on the deck. 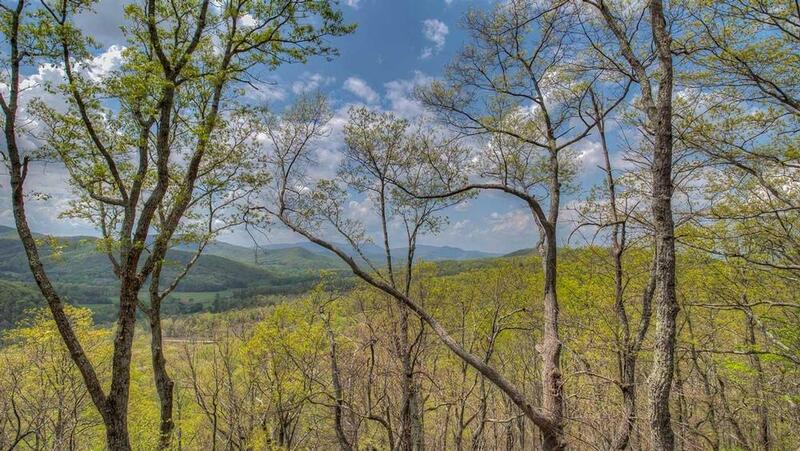 Very impressed with Escape to Blue Ridge. Gave great instructions and feedback. 06/18 - This home was gorgeous! 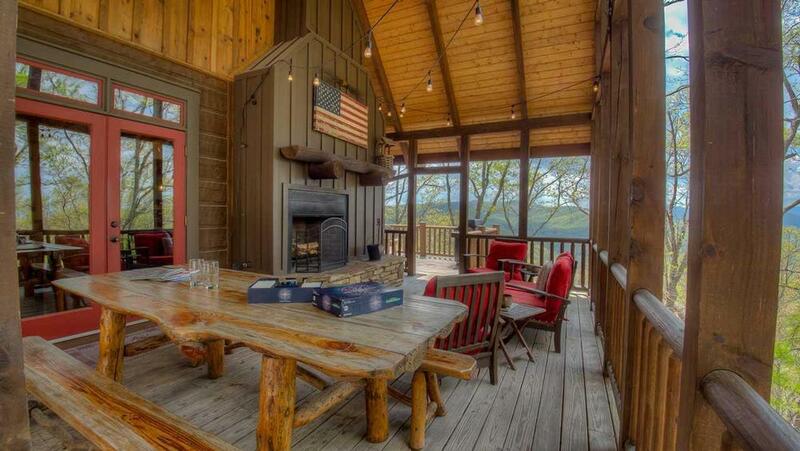 Perfect getaway with multiple families. There was plenty of space for kids and adults. When we first booked the cabin, I had several questions regarding activities and hikes for kids. The person I spoke with directed me to a source to plan out our weekend. Our long weekend couldn't have been any better! 4/18 - Beautiful views. Good company, very convenient to rent from. 1/18 - Loved the cozy cabin and the fabulous view!! 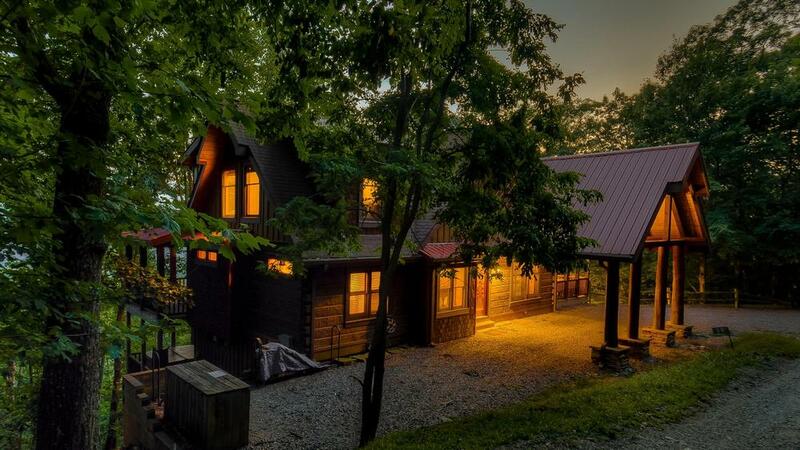 One of my very favorite cabins!!! The staff are extremely courteous and helpful. 09/17- The view was hands down the most stunning feature of the home - it is even better in person than in the pictures. Simply stunning. The outdoor gathering area and fireplace was also a key feature for our group, as well as the many bedrooms spread over 3 different floors of the house. It was a perfect location for our group of 11. I did have a couple of questions for the staff at Escape to Blue Ridge before our arrival, and both times I was contacted back and assisted immediately. I was impressed because this is not the experience I have had in the past with other companies. 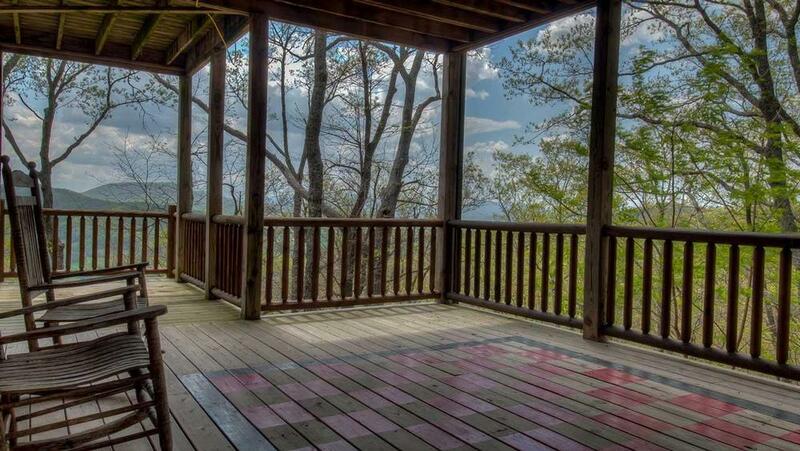 08/17- The view, and the cozy cabin feel perfect for a family reunion. Outdoor fireplace on porch was used daily! The decks are awesome! 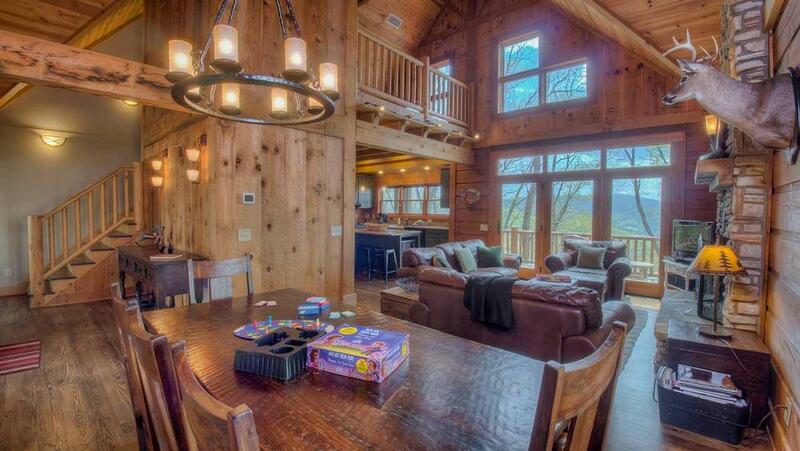 Glad they don't have too many games like some cabins! All of us including the kids spent quality time outdoors hiking and enjoying the mountain air! Very professional, courteous, and friendly! 07/17- We loved the view from the porch! We were extremely impressed when we called about the grill not working. They had a guy that was there to fix it in about 30 min. 05/17- The floor plan allowed everyone their own space, we enjoyed having different areas to hang out each night. 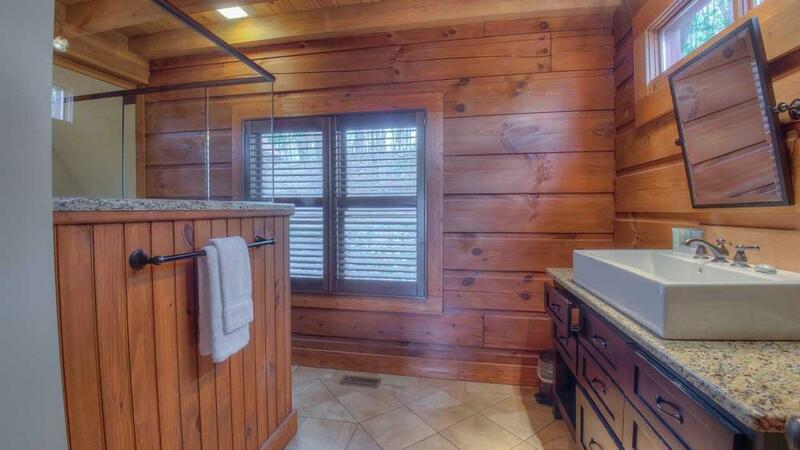 (Jacuzzi, fireplace outside). Very kind and helpful staff. 01/17- The balcony and the view is spectacular! Professional, organized, & pleasant to deal with. 11/16- Spacious cabin. Beautiful views. 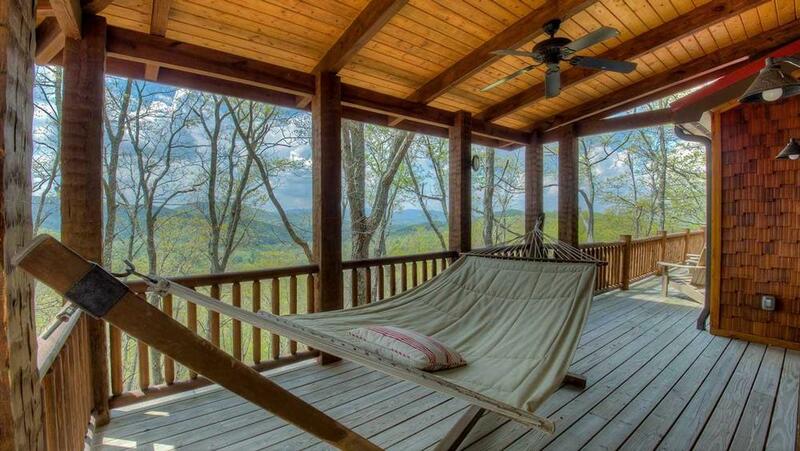 Relaxing hammock. Loved the decor. Excellent company. 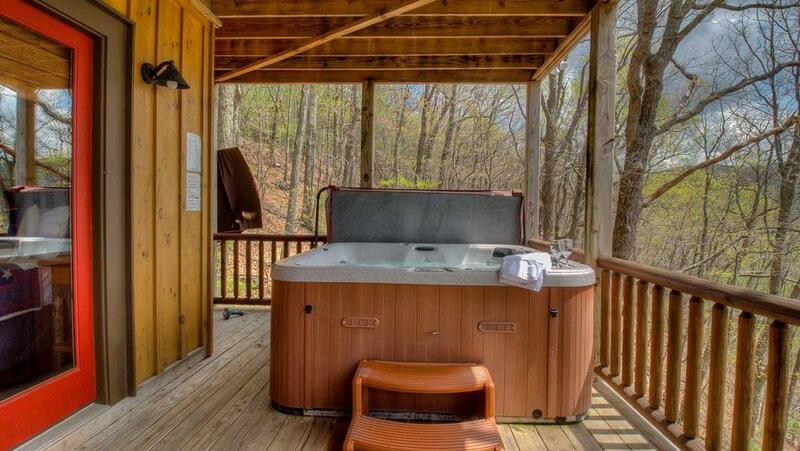 10/16- We loved the appearance of the cabin, the hot tub, pool table, comfortable beds and the scenic view. It's a very nice home, we liked the layout and the number of bedrooms. The staff are very nice and easy to deal with. Knowledgable, timely and helpful people on the phones. 08/16- Chestnut Lodge was beautiful, though the gravel road was a bit challenging. The Enchanting Forest loop was beautiful and provided a nice (if steep) place to walk, and the views over the valley were amazing. The spacious table on the deck and in the kitchen offered lots of room for everyone to eat together, but there was plenty of room to spread out inside. 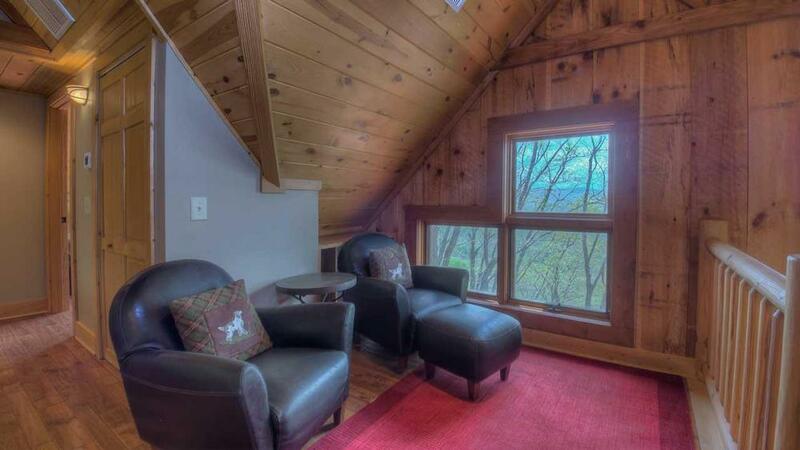 The chairs in the loft provide a great place to enjoy the view and a nice breeze off the mountain, and the beds were comfortable. We are looking forward to going back in the future. 07/16- Loved the space for our large family. 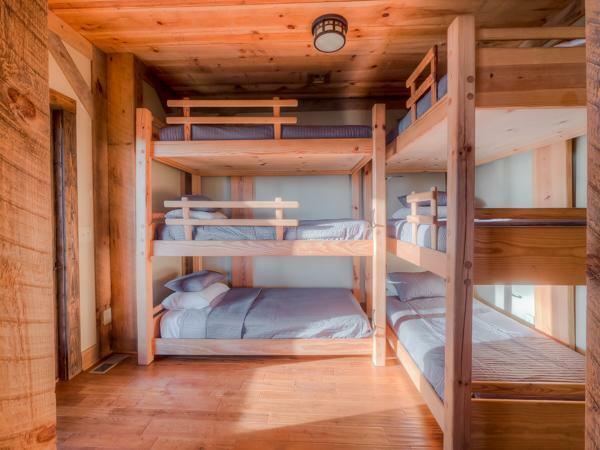 Kids loved the bunks! Outdoor fireplace was nice. You all are very friendly, easy to work with and had no problems. 03/16- Everything was prepared when we walked in the door. Hot Tub was heated, ice in the freezer, clean and inviting. 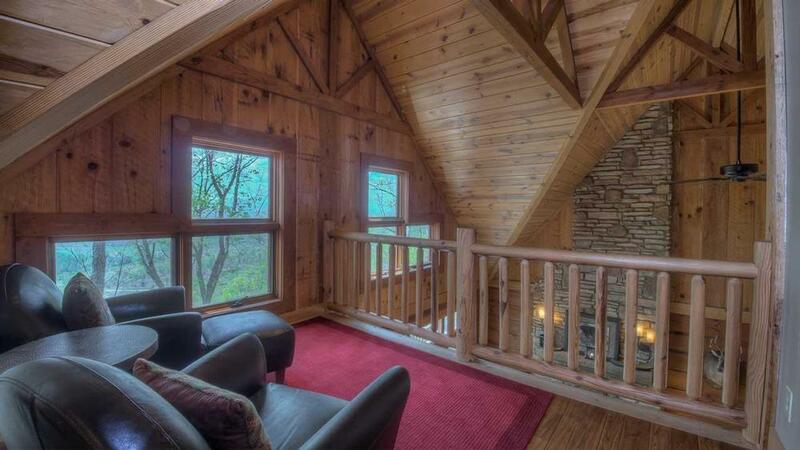 03/16- Chestnut Lodge is awesome! We mostly enjoyed the outdoor covered 'porch' area, complete with a long table, few chairs, and outdoor fireplace. We LOVED the outdoor lights draping across, and the firepit wood- thanks! 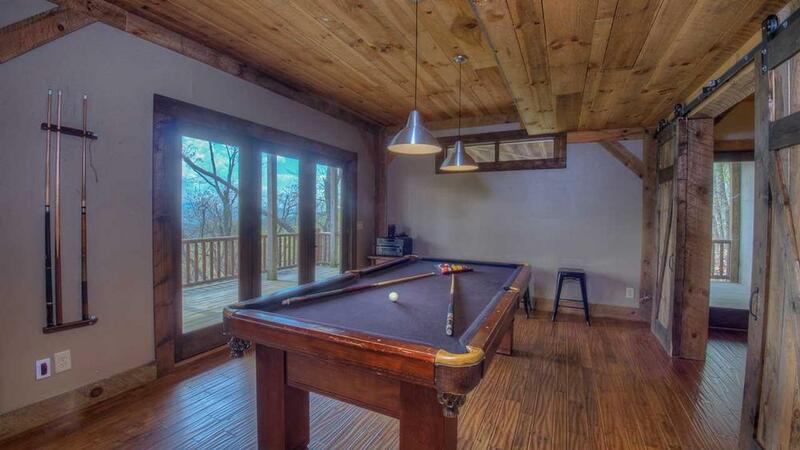 The hammock and pool table were other favorite features. The beds (especially the master) were very comfortable! The master shower is great. We loved the huge porches & beautiful views. 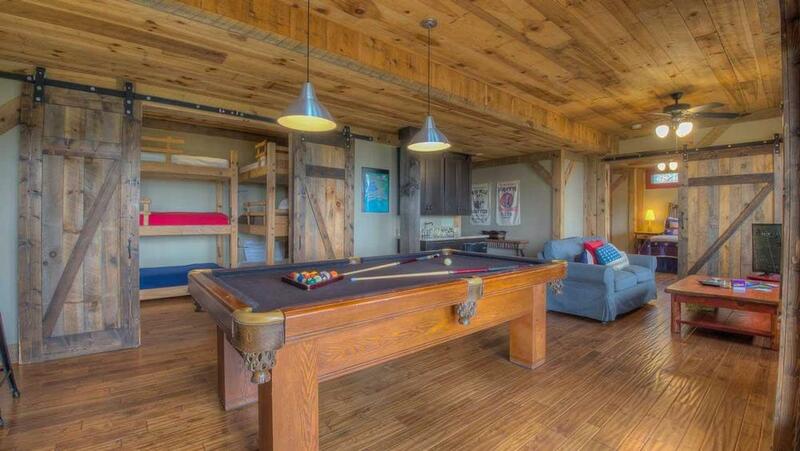 The barn doors in the basement are a fantastic touch. Very 'cabiny' feel throughout the house, which is what we were looking for. Everything was as it seemed in the photos and description; very accurate. We loved it & hope to come back! 03/16- It's a very relaxing place. Awesome holiday. 02/16- I loved the view and the back porch. 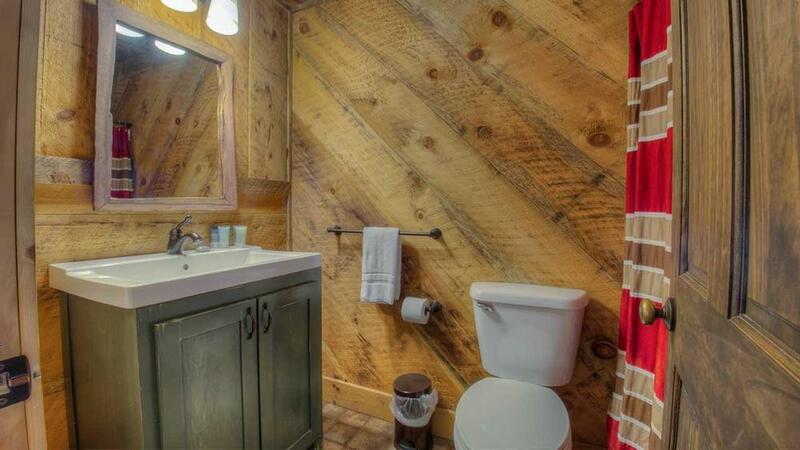 The bathrooms were also nicely stocked with towels. Everyone at the company was wonderful and helped with anything I needed during booking process and while I was there. 12/15- Nice house. No heat though. 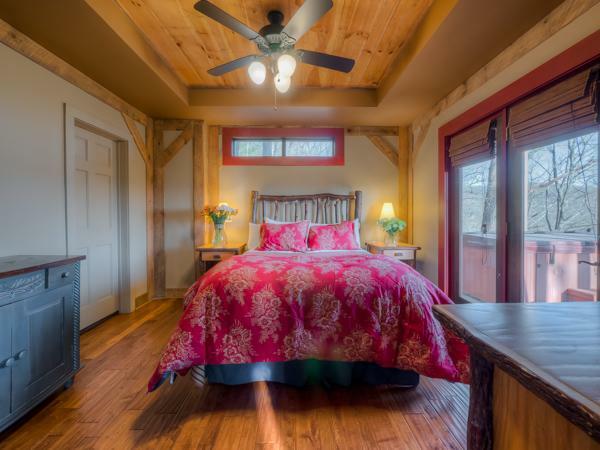 11/15- The cabin had everything, the right number of and perfect size bedrooms, abundance of outdoor space, updated and eye catching bathrooms. 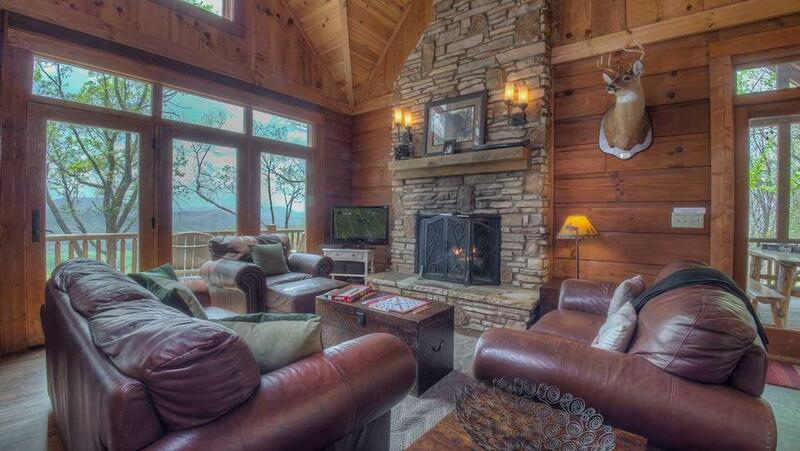 ample fireplaces, panoramic views throughout home.It was breathtaking. Everything a host could need and want was readily available. Open floor plan with views to my family throughout the home was a added bonus. I enjoyed seeing their faces throughout our stay. This was my first experience with Escapetoblueridge and I must say it was indeed a pleasant one. Thank you, for making this an easy and enjoyable experience for me and my family. Our memories will last forever. 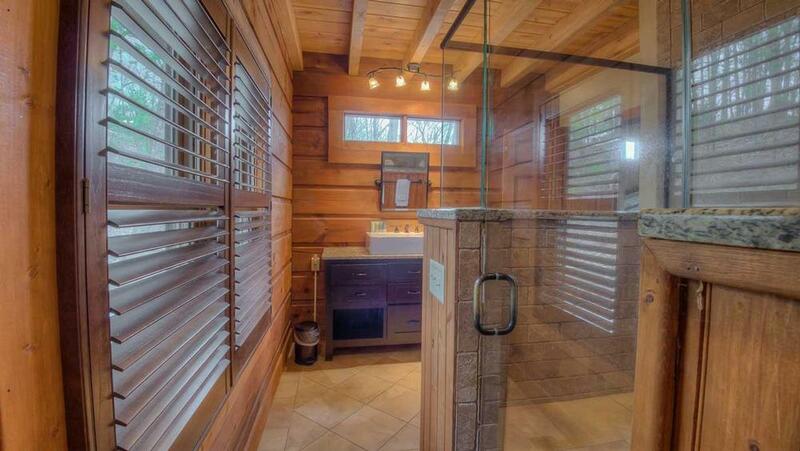 08/15- The cabin had tremendous space that allowed privacy among our guests. 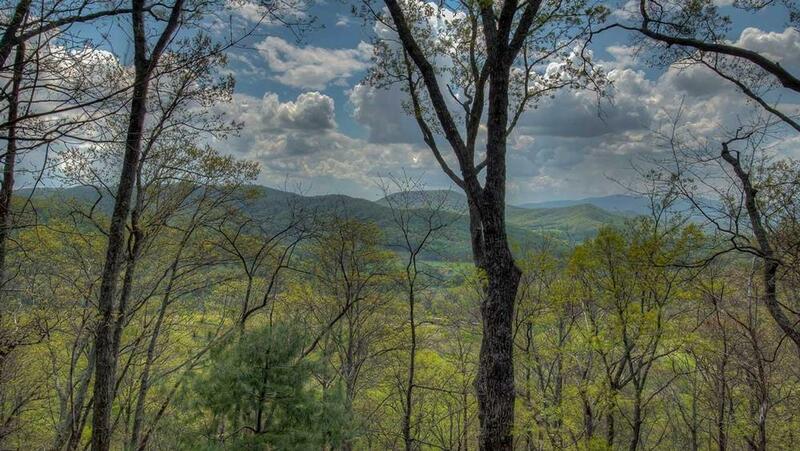 08/15- Great location, views are beautiful, outdoor fire place fantastic. Very professional company! 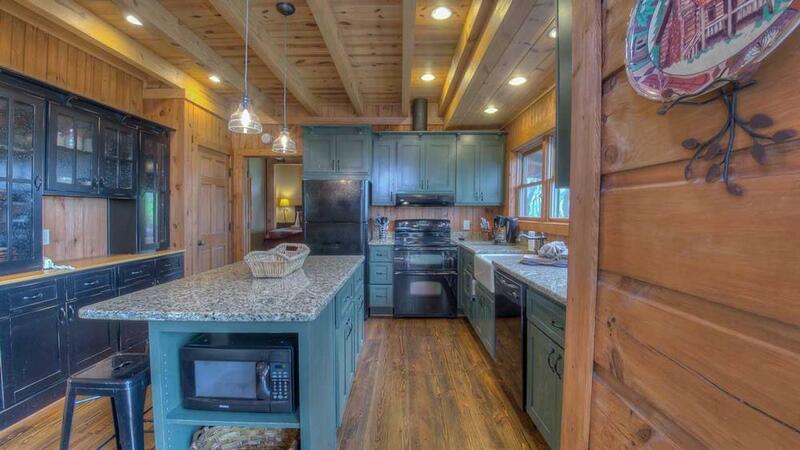 07/15- Chestnut Lodge was beautifully designed and planned, but it was worn and not clean. When we arrived we walked through cobwebs and one of the beds upstairs had an insect between the sheets. Everything was thick in dust. We liked the house but had a bummer first impression. It seemed like the \"checklist cleaning\" items were complete such as number of dish towels, bath towels, soaps ... but no sign of actual cleaning. We called the morning after our arrival and were told that someone would make it by, but no one ever showed up. We finally just washed all of our linens and cleaned the main living and kitchen areas, knocking down webs and cleaning the top of the refrigerator and island lights. These were so thick in dust we could write on them with our finger. 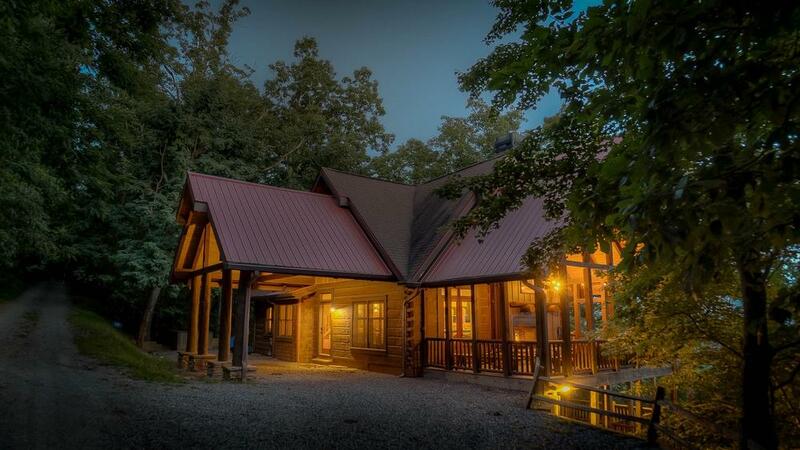 This was our summer vacation and we invested in the lodge based on the perfect photos shown online. We are \"country people\" and understand it is hard to control bugs and spiders, but this house was just plain dirty. We are so disappointed and feel mislead by what we understood we were getting for our investment. After paying a cleaning fee, we expected a clean cabin. We are interested to see what you will do to make this right. 06/15- We enjoyed the porch space and the space downstairs to corral the kids most of the time. 05/15- Secluded with a beautiful view. 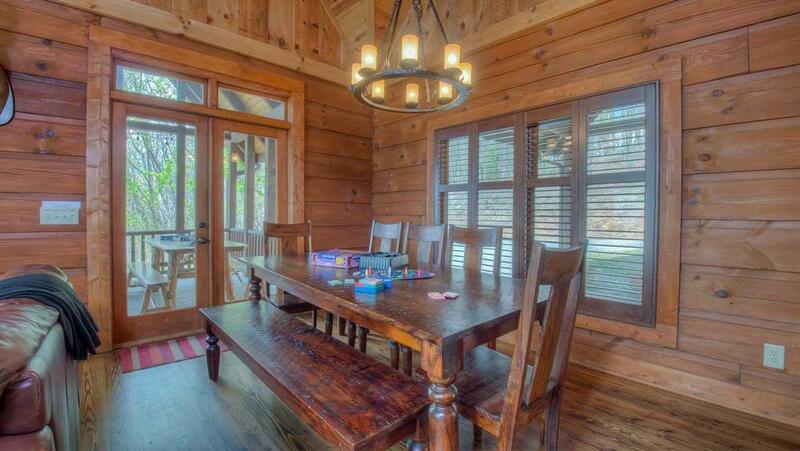 Gorgeous cabin, very spacious. 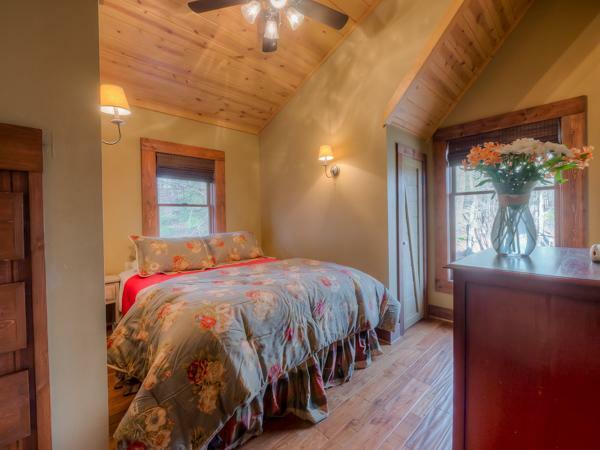 03/15- It was large and accommodated our all of our guests comfortably. 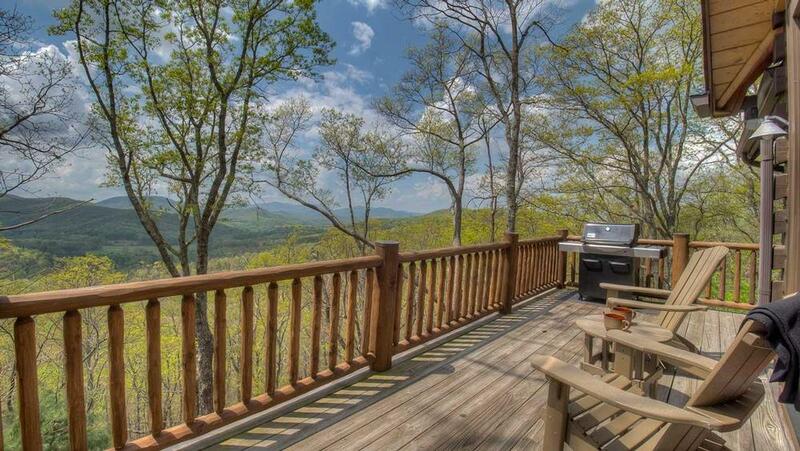 I also loved the view of the mountains from the porch. 02/15- Amount of sleeping capacity. Great view. Great home. Plenty of linens. Everything was great. Weather was cold. That's what we expect when we are in the mountains. Grandkids loved it. 01/15- The downstairs play room with billiards. The kids loved the bunk beds. 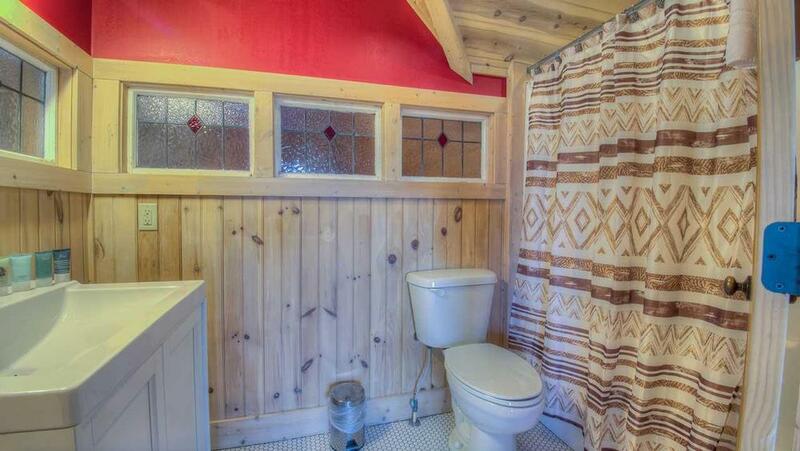 The master bedroom ensuite is excellent. The porches are gorgeous. Beautiful property. 01/15- View was awesome! Space was larger than it looks. Outdoor fireplace and hot tub was very nice although we did not choose to use the hot tub. 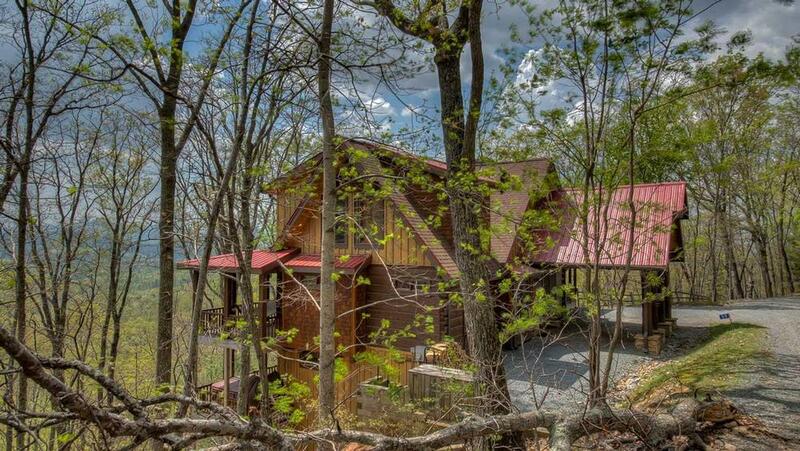 12/14- The kitchen, master bath, the view, the loft sitting area & all the needed bedrooms for space were favorite features.I love Escape to Blue Ridge this was our 3rd year in a row coming for Thanksgiving & will continue the tradition. 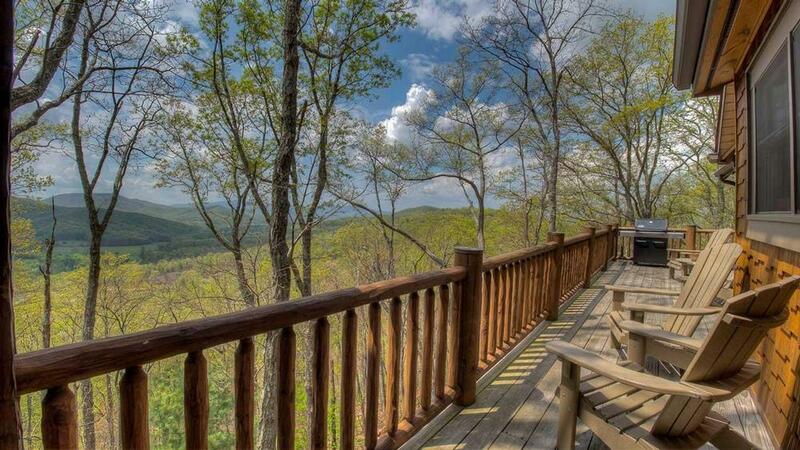 We love all of the cabins & the views they are always excellent!! Always leave great family memories. 11/14- The spacious floor plan and incredible view of the mountain.This was my 2nd cabin rental with escape to blue ridge. I'm very impressed with the company and the array of rental properties available. 11/14- The home and the view were better than expected. We loved everything about it, however, we were not told that the gas fireplace was not working, which was a huge disappointment for everyone, since it was cold and snowing. Other than that, it was amazing!! The staff are friendly and helpful. The emails were timely.